This weekend saw four officers in multiple U.S. cities either critically injured or losing their lives in the line of duty. Earlier today, we brought you the details of an ambush attack on two St. Louis police officers by an armed assailant. This video, posted on Facebook by news reporter Alicia Neaves, provides details of another police shooting, this one in San Antonio, Texas, on Sunday. Officer Benjamin Marconi, a 20 year veteran of the San Antonio Police Department, was shot and killed while sitting in his police car not far from the department’s headquarters. 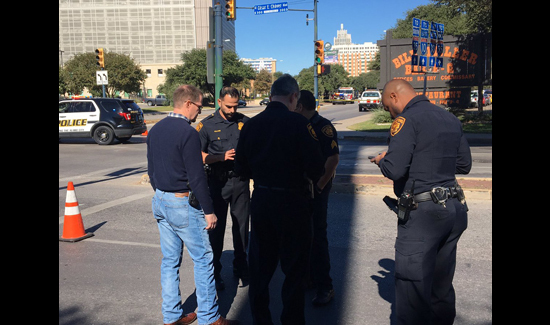 A San Antonio police officer was fatally shot in the head Sunday during a traffic stop across the street from the department’s downtown police headquarters. Officer Benjamin Marconi, 50, was shot about 11:40 a.m. on West Nueva Street and Santa Rosa Street. Chief William McManus said a black vehicle pulled up behind the officer’s squad car while the officer was inside writing a ticket. A man stepped out of the car, walked over to the passenger side of the officer’s car and shot him in the head. The gunman reached into the squad car and fired a second time. The man then got into his car and fled. Police are investigating the motive for the shooting. They describe the suspect as a black male with a beard. He is about 5 feet 7 inches to 6 feet tall. He was last seen wearing a gray sweatshirt and black baggy pants.